Important notice: The open mike previously scheduled for the first Monday in May has been rescheduled due to a conflict with the Library meeting room. The new date will be Monday April 29 (see the schedule below). This page provides information about the long running Acoustic Music/Poetry1or, Spoken Word in general Open Mike, known as “Ellen Schmidt’s Open Mike”2The open mike is named in honor of Ellen Schmidt, who founded it and ran it for decades at various venues in the Boston area. 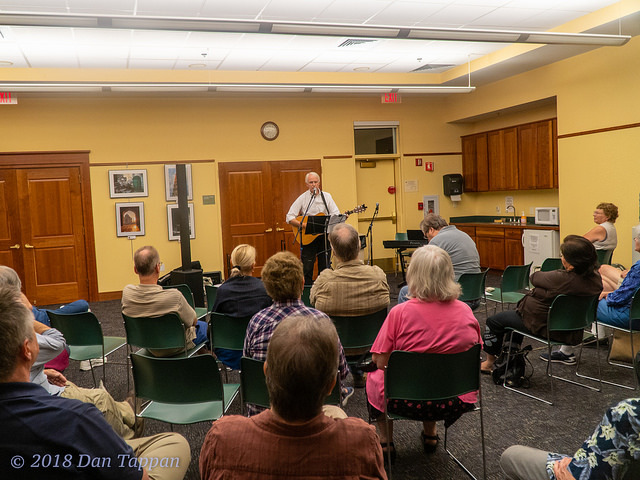 The Open Mike is held approximately once a month, usually on the first Monday of the month3subject to working around holidays and occasional schedule conflicts on the part of the organizers. The current location is the Meeting Room at the Sargent Memorial Library in Boxborough MA. What is an open mike? An Open Mike 4sometimes called an Open Mic, but see here for discussion on the preferred terminology provides a venue where audience members can practice performing and/or share songs and spoken material. Performers can range from professionals trying out new material, to practiced amateurs5in the sense of people who write or perform for the love of art, to people who are totally new at performing and want to gain experience in a supportive environment. Above all an Open Mike is a community of people sharing their art. Free to perform or attend and listen. There is a voluntary “pass the hat” for the feature performer, but contribution is not required. The Open Mike runs from 7:30pm to approximately 10-10:30pm (depending on the number of performers). Each performer has a 5 minute performance slot; usually this will be enough time to perform one song, with introduction, or a few short poems. Occasionally, if signups are light, there may be an opportunity for some people to get an extra slot at the end of the night. Performance times are selected by a random drawing of the people registered to perform, usually the day before the open mike. If people have special time constraints we try to be supportive. We encourage people to preregister for a performance slot; we try to accommodate walk-in performers if possible, but cannot guarantee them a chance to play due to time limits. Usually each open mike will include one Mini-Set Performer and one Feature Performer. The Mini-Set Performer goes on at 8:15pm, performing 3 songs or 15 minutes. The Feature Performer goes on at 8:30pm and performs for 1/2 hour (generally 5 songs plus an encore). Mini-Set and Feature Performers are usually selected from people who attend the open mike regularly or supporters of the Boston Open Mike scene in general. There is a voluntary pass-the-hat for the Feature Performer during their set. Anyone. Young or old. Amateur or professional. Songwriters, Poets, Storytellers,. Musicians who play or sing covers, original songs, traditional songs, standards, modern pop songs, folk, blues, classical, whatever someone is moved to perform. This is usually an acoustic music or spoken word open mike. We don’t have a drum set or a backline for electric instruments, though we can usually plug them into the sound system. The usual mike setup can accommodate groups of 2-3 people – two vocal mikes, one instrument mike, and two instrument plugins – please ask in advance if you need more than that. There is often a keyboard available for use, but check in advance if you plan to use it. Anyone. We appreciate people registering in advance so we can make sure there are enough chairs available.